Find hotel near Our Lady Of Lourdes Grott .. 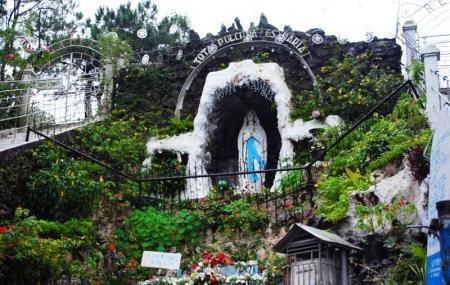 The grotto is a catholic shrine that is a favorite pilgrimage site for Filipinos especially during Holy Thursday and Good Friday. The only two ways to access the top of the grotto is by climbing the 252 steps or by driving a light vehicle through a winding, narrow and steep road. Devotees who go up to the grotto to pray usually light up a candle at the altar. There are a number of vendors at the shrine who are willing to substitute your presence and pray on your behalf if you cannot gather the strength to climb the stairs. Or you could just buy a strawberry taho from them as a reward for the excruciating climb. If you plan on climbing the stairs to the grotto, it is better to carry water with you. How popular is Our Lady Of Lourdes Grotto? People normally club together Our Lady Of Atonement Cathedral and Bencab Museum while planning their visit to Our Lady Of Lourdes Grotto. It was our first time to visit the place. It has an aura of sacredness despite the area being crowded with devotees and tourists. The chapel provides a sanctuary where people can slip for a moment and say their prayers. I just hope that the visitors refrain from taking pictures right outside the entrance of the chapel because there is a tendency to forget that silence should be observed, or better yet to take pictures without disturbing the peace and quiet of the chapel. Had a great experience despite of the battle in stairs haha. Up and we go ...still cant believe i made it to the top. Its a great experience. Thank you mama Mary i know you pushed me up. Our Lady of Lourdes Grotto This is a Catholic shrine and pilgrimage site assigned to Our Lady of Lourdes Grotto, located on Dominican Hill Road Baguio, Philippines. The site also features a statue of Virgin Mary and close by is another statue of Jesus Christ. The shrine is reached after climbing 250 steps beautifully laid down in natural settings. A road has also been constructed which takes right upto the top. It is a good walk and exercise. At the top you can do the Hail Mary with a nice recording on the hour. Or do it on your own. Perfect place to pray. Its like ur near to heaven already. I hope this will turn to a solemn place not just a photo op for visitors.